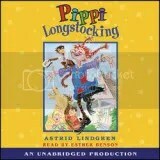 Posted on June 13, 2011	by Katy K.
Pippi Longstocking by Astrid Lindgren. Read by Esther Benson. I read Pippi multiple times as a child, of course, but hadn’t reread as an adult. And I tried Pippi on my son a couple of years ago – he would have been three or four – with high hopes that were soon dashed. It just didn’t work for him. Now, however, he is a big six-year-old, with kindergarten behind him and newly chafing at the rules that define childhood. In other words, ready for tales of a girl who defies the rules, who lives by herself and does what she wants. Even when the adults get upset with her, she ends up being loveable and saving the day her own way. I had remembered Pippi as a coherent story, and so was somewhat surprised to find that each chapter is a more or less independent story, with only the three main characters coming through from one story. Pippi rolls out cookies by the hundreds on her kitchen floor and gives Tommy and Annika lavish presents from her treasure stash. She rescues small children from bullies and fires, decides that school is much too restrictive for her, and puts on a better show than the circus. Though my LB is used to listening to books with longer plots, I’d imagine that these shorter stories would be ideal for introducing children to longer books, with continuing characters but shorter plot arcs. It’s a classic book, and Esther Benson reads it in classic style – which made me chuckle, too, as Pippi sounds much more refined than I imagined her being. We’ll be coming back for sequels. This entry was posted in Uncategorized and tagged audio, classics, youth. Bookmark the permalink.